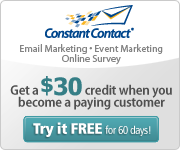 Posted by StrategicGrowth in mobile coupons, Mobile Marketing, Strategic Growth Concepts. 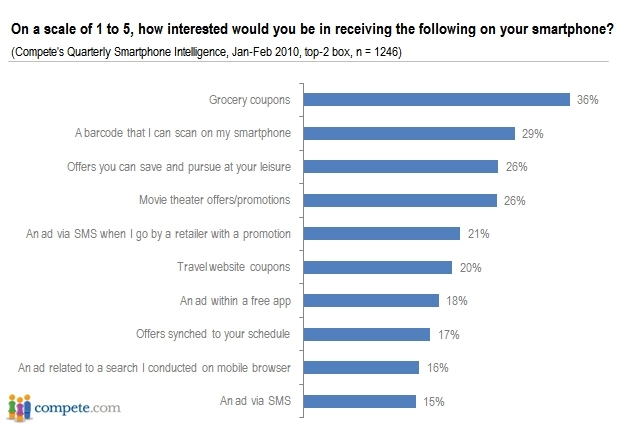 A new survey published by Compete.com indicates smartphone owners are very receptive to mobile coupons, especially when it comes to grocery coupons that are easily redeemable via barcodes scanned directly from the device. The survey, which looked at the time of day most smartphone owners use their devices, as well as what mobile advertising concepts they’re most interested in, found that usage during commutes to work and while watching TV were the highest on the list by far. To find out their receptiveness, the survey asked smartphone owners how interested they were in receiving various types of mobile advertising. The results were quite interesting, indicating consumers were most interested in receiving grocery coupons (36%), scanable barcodes (29%), offers to save and pursue at leisure (26%), movie theater offers (26%) and ads via SMS when going by a retailer with a promotion / coupon (21%). The fact that over 1 in 5 smartphone owners would be interested in these top-5 concepts is very promising for the mobile marketing industry, considering that it’s still in the early stages of mainstream adoption. Given the nature of smartphones, adoption via this user-group will signal what works and what doesn’t- with concepts that do see mainstream adoption via smartphones making their way to feature phones eventually. It’s not surprising that barcodes, coupons and other retail-oriented mobile technologies are the first to catch on with consumers. It’s a concept that provides the most value to users, while not interfering with daily usage like some other concepts. 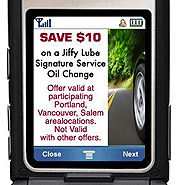 Should you be interested in learning more about mobile coupons and how they can help grow your business, or mobile marketing in general, please review the mobile section of our website, additional mobile marketing articles within this blog, or contact us directly via the website or email at info@strategicgrowthconcepts.com for a FREE initial consultation.